The Tennessee Titans visit the San Francisco 49ers in Week 15 of the 2017 NFL season. PFF previews the top player matchups of the game. QB Marcus Mariota vs. 49ers pass defense – Mariota is on the heels of his worst performance of the season. In last week’s loss against the Arizona Cardinals, he posted a 50.2 overall grade, which was a season-low for games he’s finished. Mariota has been at his worst this season when he’s thrown against Cover 2 zone and Cover 1. When he’s thrown against Cover 2 zone, he’s completed 69.1 percent of his passes for 519 yards and seven interceptions. When he’s faced Cover 1, he’s completed 58.3 percent of his passes for 692 yards and four interceptions. He’s fared much better against Cover 3, Cover 4 and Cover 6, completing 69.8 percent of his throws for 1,188 yards, six touchdowns and two interceptions. Five of his touchdown throws came against Cover 3. 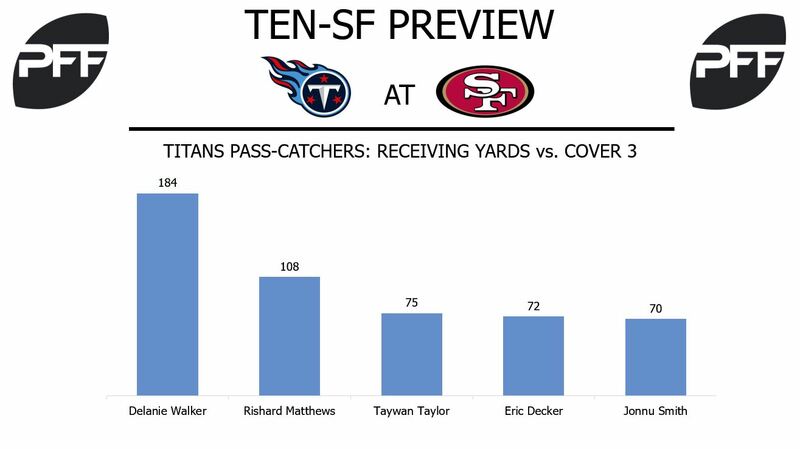 The 49ers have deployed Cover 3 on 38.6 percent of the pass attempts against them this season. When in Cover 3, they’ve allowed 110 completions on 165 passes for 1,368 yards, five touchdowns and two interceptions. On the 120 pass attempts against them in Cover 1, they’ve allowed 69 completions for 904 yards, four touchdowns and one interception. They’ve deployed Cover 2 zone on only 6.3 percent of pass attempts against them. WR Corey Davis vs. CB Dontae Johnson – Davis has struggled to find his groove in his rookie campaign. He’s averaged 1.07 receiving yards per route run, which ranks 70th for his position. In addition, his 41.7 wide receiver rating is last among 82 receivers that have seen at least 38 targets. This week, Davis receives a favorable matchup against Johnson, whose overall grade of 36.3 ranks 116th out of 118 qualified cornerbacks. Johnson has allowed an average of 1.56 receiving yards per coverage snap, which is the fifth-highest rate among cornerbacks that have registered at least 271 coverage snaps. He’s allowed 680 receiving yards, five touchdowns and a passer rating of 119.9. T Jack Conklin vs. Edge Elvis Dumervil – Conklin’s pass-blocking grade of 82.1 ranks 10th among tackles this year. He’s allowed only two sacks and has a pass-blocking efficiency of 96.2, which ranks 13th for his position group. Dumervil leads all edge defenders with a pass-rushing productivity of 15.7. He’s forced 32 of his 39 total pressures from the left side. QB Jimmy Garoppolo on passes between the numbers — Garoppolo has impressed during his first two starts as the 49ers quarterback, earning an 81.2 overall grade that would rank 14th on the year if he had enough snaps to qualify. Most of his work has come on passes over the middle of the field in the short and intermediate areas (passes traveling 19 yards or less), where Garoppolo has completed 27-of-35 attempts. His 11.6 yards per attempt on those throws is the third-highest over the past two weeks. 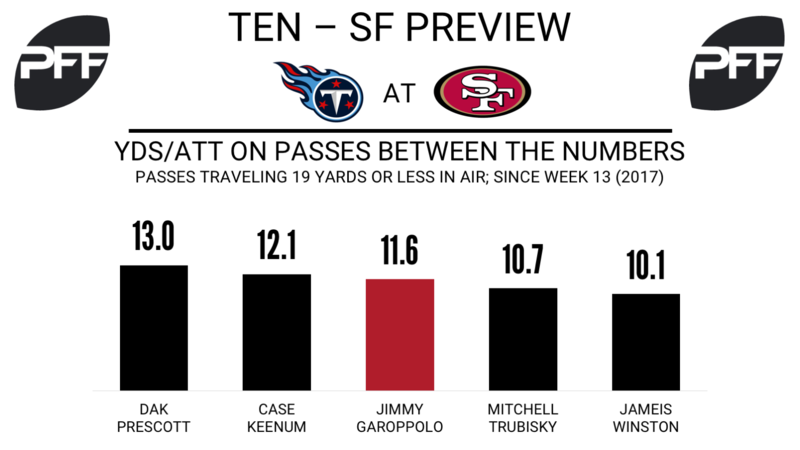 Garoppolo will face a Titans defense this week that has allowed the fifth-worst passer rating (108.4) on passes between the numbers this season. WR Marquise Goodwin vs. CB Adoree’ Jackson — After earning an overall grade of 80.0 or higher just once in his first 10 games this season, Goodwin has done exactly that in each of his past three games. Goodwin remains a very good deep threat, but where he’s really been able to step his game up recently is in the intermediate area. During his first 10 games, Goodwin caught just 10-of-21 targets traveling between 10 and 19 yards in the air for 155 yards. Since Week 12, Goodwin has hauled in 10-of-12 such targets for 172 yards. Tennessee has recently started having one of their cornerbacks shadow the top opposing receiver, with Jackson and Logan Ryan each doing so twice over Tennessee’s last five games. Ryan has drawn the assignment when facing larger wideouts (A.J. Green and Larry Fitzgerald), while it’s been Jackson’s duty against shiftier players (Antonio Brown and T.Y. Hilton). Should that hold, it’s likely we’ll see Jackson get the call in this matchup. Jackson has been solid in coverage this season with a 79.4 coverage grade (39th of 118). T Joe Staley vs. Edge Brian Orakpo — Staley has been excellent in pass protection over his past five games, allowing just one sack and three total quarterback pressures, including three games where he didn’t surrender a single pressure. The veteran left tackle’s 98.5 pass-blocking efficiency over that span is tied for the second-best among qualifying tackles. Staley will spend the bulk of his day facing off against another player who has been hot of late in Orakpo. Tennessee’s top edge rusher has collected 12 total pressures in his past three games and is tied for the most sacks among edge defenders during that span with five.